Bodyweight squat is an exercise that focuses mainly on the quadriceps muscles of the body and it helps to strengthen it if we make a routine and perform bodyweight squats everyday. Now there arises a key question in everybody’s mind that, can I do squats everyday? Well, we will discover the answer to above question in today’s awesome blog post. Doing squats is not a big thing as anybody can do squats. So, why it is so important to read this post if you already know how to squat? Well, the answer is very simple. Doing squats is one thing but doing squats properly is another. You cannot get perfect results unless you know how to perform perfect bodyweight squats. There are many people who can squat but only few can do a proper bodyweight squat, and only a few out of them knows the technique to perform an excellent bodyweight squat. The reason of not doing a perfect squat is that most of the people either too tighten the body or make it too loose while performing the places in a squat and they never learned how to squat perfectly. Well, you don’t have to worry that anymore, as we will teach you how to do perfect bodyweight squats. So let’s get started. Bodyweight squat is one of the most fundamental exercises and anyone can do a perfect squat effortlessly and without pain. And if you can’t, then this is a something worth working as it will pay off in both the short and long term. Now, back to your question, can I do squats everyday? The answer is YES. Any human being can benefit from learning and be training the squats every day and bodyweight squats are the first exercise that you should learn and master in squats exercise. 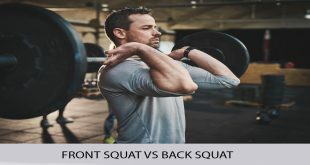 So, you’ll learn both the basics of proper squat technique and also many objectives in this detailed post on bodyweight squats everyday, that will improve your performance and body muscles strength and shape. Also, it will help you to maximize your results and minimize the risk of injury and other subtle factors involved. Any exercise requires some warm up. 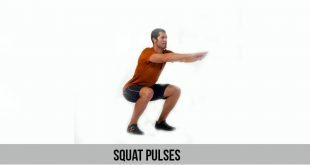 Same is the case with bodyweight squats, so before starting bodyweight squats you need to some warm up. Make few push-ups and jumps, stretch your legs or maybe walk a little before starting the exercise. In case you have a knee trouble, make sure to wear a brace for support before you start this workout, because bodyweight squats mostly put pressure and weight on your knees. 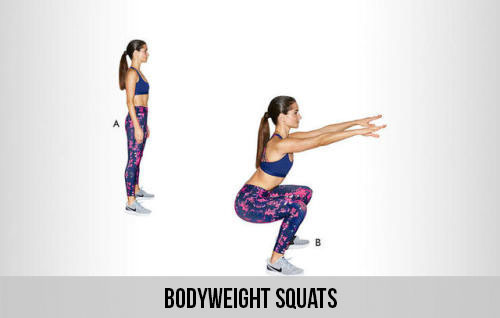 Bodyweight squat does not require any gym equipment, floor mat or a gym trainer. But make sure you are doing it in a safe place like a plain floor where you can balance your body properly. To perform a bodyweight squat, keep your feet straight on the floor on a bit wider distance apart as of your shoulders width and extend your arms straight out in front of you. Now bend your legs slowly by going down by keeping your feet grounded firmly and make sure to keep your back as straight as possible. Keep your head up and straight throughout the exercise and inhale and exhale your breath slowly. Keep going down until your thighs are parallel to the floor, and then stand back up slowly to complete one squat. Try to do at least 10-12 squats continuously and then take a short break of about 2-3 minutes. Drink plenty of water while on a break, and warm up a bit until you are ready to start the next set. If you had trouble maintaining your balance during the first set or faced any difficulty performing the squats then try putting your hands on your hips during the next set to perform squats. Perform 3 sets every day each consisting of 10-12 squats. It could be difficult for you in the beginning for a week or so, but once you gain strength of your legs, you will be able to perform the bodyweight squats everyday easily by extended out your arms in front of you without taking any hip support. Once you start doing bodyweight squats everyday, it will become a very easy exercise for you. In order to gain more good results out of this exercise, you can increase the intensity of this exercise by prolonging the sets of squats. Set few minutes time using a stopwatch instead of doing 10-12 fixed numbers of squats. By doing so, you will see a remarkable increase in time and stamina of your body to perform more squats and for the longer period of time. This will eventually reflect on your body shape and muscle strength. It could play a vital role in your daily life by improving your strength, conditioning, mobility, stamina, and flexibility.